In this series RBTH examines the natural and cultural wonders that make up Russia’s 26 UNESCO heritage sites from east to west. UNESCO is a special agency of the UN that seeks to promote peace and security through international collaboration. Its World Heritage Site program seeks to preserve natural and cultural landmarks that are deemed of global significance. Part two in this series begins with one of Russia’s most famous natural landmarks, Lake Baikal. The largest freshwater lake in the world, Lake Baikal is a no-brainer addition to this list. The deepest lake in the world at 1,642 meters (5,387 feet), it is also among the world’s clearest and oldest, with some estimates putting Baikal’s age at 25 million years. 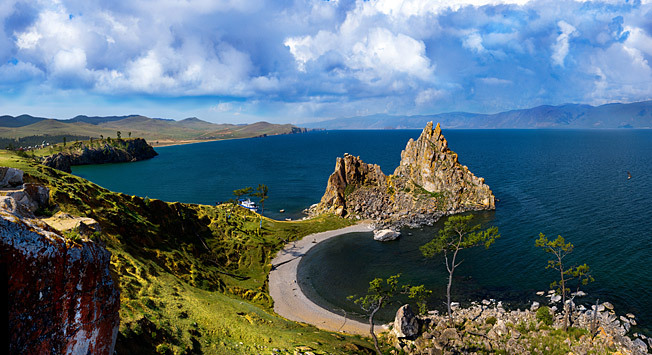 Located in a rift valley, Baikal is still actively growing at the rate of 1-2 centimeters per year and by surface area it is the seventh largest lake in the world, containing more water than the five Great Lakes of North America combined. The rich and unusual biodiversity of Lake Baikal is its calling card. Thousands of species of plants and animals live in or near the lake and many of them can be found nowhere else on Earth. The list includes seals, translucent fish and invertebrates, including worms, crustaceans and plankton, snails and sponges. Among the most famous endemic inhabitants are the Baikal seal, a rare freshwater breed; the omul, a whitefish that is smoked and is associated with the lake; and the Baikal sturgeon, an endangered fish that lives at the lake’s northern shores. How to get here: By plane or train to Irkutsk or Ulan-Ude; from Irkutsk it is approximately 65 kilometers to the nearest point on the Lake; from Ulan-Ude it is approximately 250 kilometers. Lake Baikal can easily be reached by either city by taxi or bus. Located 100 kilometers north of the Arctic Circle at the northwestern edge of the Central Siberian Plateau in Krasnoyarsk Territory, the Putorana Plateau area is a classic pristine northern landscape of taiga, tundra and Arctic desert. It features arctic and subarctic ecosystems within the relative isolation of a mountain range. The surrounding area contains 25,000 lakes (Russia’s second largest supply of freshwater after Baikal), deep canyons, cold-water rivers, thousands of waterfalls and fjord-like natural constructions formed in the landscape. One of the world’s remaining major reindeer migratory routes crosses through the area and the territory also hosts the Putorana bighorn snow sheep, an isolated subspecies of mountain sheep. With almost no human infrastructure to speak of (the nearest settlement is hundreds of kilometers away), the Putorana Plateau was included on the list for containing such an enormous array of plant biodiversity in an Arctic setting. How to get here: This territory is administered from the closed industrial city of Norilsk, which lies 200 kilometers to the west of the Plateau. Needless to say it is complicated, but possible to visit here. Permits and guides are necessary, as is at least one helicopter ride. The following website goes over possible routes and some of the obstacles. This site is part of a large group of basins throughout Central Asia, with the Uvs Nurr being the only one found in Russia. Essentially this is where the southernmost taiga meets the northernmost sand dune desert. This highly saline and shallow lake is a remnant of a huge saltwater sea that covered a much larger area thousands of years ago. Today its borders are shared between the Republic of Tuva in south Siberia and Mongolia, where approximately 90 percent of the lake is located. Bearing traces of the steppe and the desert, this area contains enormous biodiversity ranging from freshwater to saltwater; deciduous, conifer and floodplain forests; and remnant glaciers from glacial lakes. It is one of the largest intact watersheds in Central Asia and features approximately 40,000 archeological sites detailing the history of nomadic tribes that roamed the steppe. Temperatures can fluctuate over 100 degrees from cold to hot in a calendar year, yet over 100 bird species and the endangered snow leopard, argali (wild sheep), and Asiatic ibex (wild goat) all call this area home. How to get here: Kyzyl, the regional capital, has a small airport, but it is probably best to take a train or plane to nearby cities of Krasnoyarsk or Abakan and take a bus or taxi to Kyzyl and then arrange to go to the lake with a tour or hire a taxi. One of Russia’s most picturesque corners, the Altai Mountains forms a watershed between Central Asia and the Arctic Ocean via the Ob River, which begins its journey north here. Many landscapes are can be found here including mountainous taiga, steppe, lake basins, valleys and mountain meadows. There are nearly 1,500 glaciers here, the result of having survived five different glacial periods. Animal life is also abundant and diverse with more than 70 unique mammals and 300 bird species. This area became part of the Russian Empire in the mid-18th century, yet it has been home to man for one million years, leaving behind Paleolithic settlements near Gorno-Altaysk, the main city in the area. The territory remains sparsely populated by Russians and the Altai people, a Turkic-speaking group that has traditionally relied on raising livestock, farming and hunting to survive. How to get here: Gorno-Altaysk has a small airport with flights from Moscow, Novosibirsk and Krasnoyarsk. See schedules here. Alternatively arrive in Novosibirsk and take a bus or taxi.